My work differs from that of many other scientists because, although I am a Research Wetland Ecologist with a research focus on Great Lakes coastal wetland habitats and invasive plant species (e.g., Phragmites australis), I have extensive involvement in the application of research results into practice and policy (e.g., development of novel adaptive management approaches). What is the role of hydrologic connectivity in the rehabilitation and adaptive management of diked and coastal wetland ecosystems in the Great Lakes? Can we find sustainable control approaches for Phragmites australis (Common Reed) and other invasive plant species? What is the landscape-scale potential for coastal wetland habitat rehabilitation throughout the Great Lakes basin? These are a few of the research questions that I have been working on during my 23+ years at the Great Lakes Science Center. My master’s work in GIS and remote sensing at Eastern Michigan University and doctoral studies at the University of Michigan provided a solid foundation for extensive work with USFWS refuges (Detroit River, Ottawa, Seney, Shiawassee), Ohio DNR, Michigan DNR, The Nature Conservancy, Ducks Unlimited, and many other partners. I’ve studied the diked and coastal marshes of western Lake Erie for many years and continue to work with managers to apply site specific results at national scales. Leadership experiences at the National Conservation Leadership Institute and within USGS have helped me produce some innovative science and push our research teams in new directions. White, James F.; Torres, Monica S.; Verma, Satish Kumar; Elmore, Matthew T.; Kowalski, Kurt P.; Kingsley, Kathryn L.
Bickford, Wesley A.; Goldberg, Deborah E.; Kowalski, Kurt P.; Zak, Donald R.
White, James F.; Kingsley, Kathryn L.; Verma, Satish Kumar; Kowalski, Kurt P.
Verma, Satish Kumar; Kingsley, Kathryn L.; Bergen, Marshall S.; Kowalski, Kurt P.; White, James F.
White, James F.; Kingsley, Katheryn I; Kowalski, Kurt P.; Irizarry, Ivelisse; Micci, April; Soares, Marcos Antonio; Bergen, Marshall S.
Clay, Keith; Shearin, Zachery; Bourke, Kimberly; Bickford, Wesley A.; Kowalski, Kurt P.
Braun, H. B.; Kowalski, Kurt P.; Hollins, K.
Soares, Marcos Antonio; Li, Hai-Yan; Kowalski, Kurt P.; Bergen, Marshall; Torres, Monica S.; White, James F.
Soares, M. A.; Li, H-Y; Kowalski, Kurt P.; Bergen, M.; Torres, M. S.; White, J. F.
Kowalski, K.P., 2016, Collaborations, research, and adaptive management to address nonnative Phragmites australis in the Great Lakes basin: U.S. Geological Survey Fact Sheet 2016–3031, 2 p., http://dx.doi.org/10.3133/fs20163031. Overcoming barriers to coastal wetland ecosystem rehabilitation: strategies for the Great Lakes. Analysis of wetland plant communities and environmental conditions: a wetland restoration project in Seney National Wildlife Refuge. Planning Begins for the 2019 Field Season. 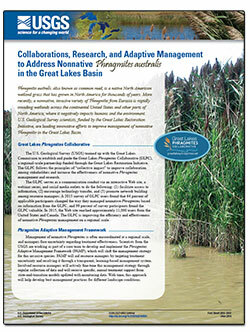 The Phragmites Adaptive Management Framework serves as an example for other programs. Webinar titled "Leveraging Partnerships: Lessons Learned from Regional Coordination Efforts" was held on November 27, 2018. The USGS Great Lakes Science Center and partners are conducting research into innovative control measures for non-native Phragmites australis – a highly invasive species with wide-ranging social, economic, and ecological impacts – specifically through manipulating the plant’s microbiome.